Item can be ordered. It's temporarily out of stock and would be delivered when available. Retractable corners mold to the shape of your tablet for an incredibly tailored fit, providing greater protection and a secure non-slip hold in all viewing angles. A velvety smooth inner lining keeps your screen safe and cushioned. 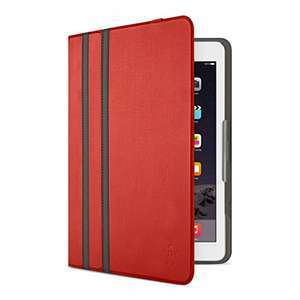 The Stripe Cover Folio has been designed to complement every feature of your tablet, including the camera. A dedicated camera flap allows you to take pictures without removing the case. The Stripe Cover Folio is made of durable, lightweight fabric that's super soft to the touch, and sports a premium two-stripe design for maximum stand out. The fold-down camera flap provides easy access to your camera when in the case, while a flexible frame ensures a secure fit and non-slip hold when typing, gaming or watching movies. OOS.... 'cause I grabbed it. Thanks OP! Thanks Vassy, got one. States one left on my phone. That's right. I grabbed one too. I bet they only sell red ones, have you seen the prices of the other colours, but the red ones are always quite cheap. No way these are worth £25 they look just like any generic cheap chinese case. Personally I don’t like these universal cases where they have straps that it over the corners of the tablet. Much prefer those with a full, made to measure clip on back. eBay is full of them.